*Dept of Surgery, Faculty of Medicine, Cairo University,**Faculty of Veterinary Medicine, Cairo University, ***Dept of Surgery, Faculty of Medicine, Fayoum University, **** Dept of Clinical Pathology, Faculty of Medicine, Cairo University, ***** Dept of Pathology, Faculty of Medicine, Cairo University. Acute pancreatitis is an acute inflammatory process of the pancreas that frequently involves peripancreatic tissues and at times remote organ systems. Approximately 20% of patients with acute pancreatitis develop a severe disease associated with complications and high risk of mortality (1) . 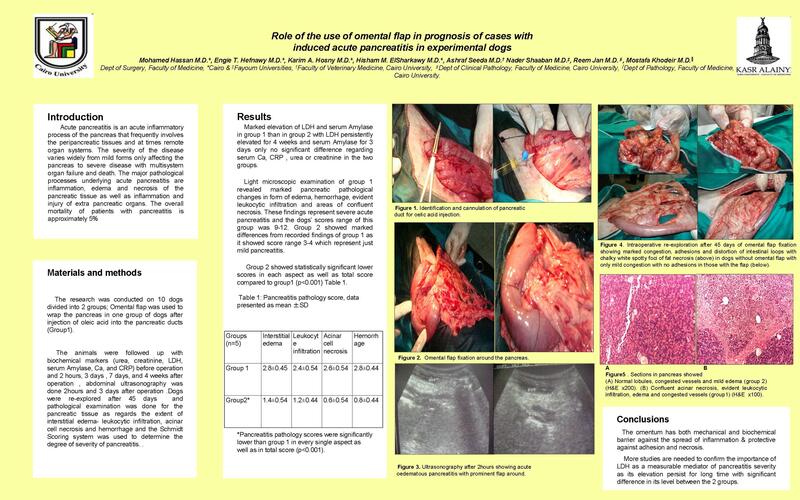 Acute pancreatitis was experimentally induced in dogs by oleic acid injection in the pancreatic duct after permission and supervision of the Eyptian Animal Friend Society. The research was conducted in animal lab. In faculty of veterinary medicine on 10 dogs divided into 2 groups; Omental flap was used to wrap the pancreas in one group of dogs after injection of oleic acid in the pancreatic duct . The animals were followed up with biochemical markers, abdominal ultrasonography . Dogs were re-explored after 45 days and pathological examination was done for the pancreatic tissue as regards the extent of interstitial edema- leukocytic infiltration, acinar cell necrosis and hemorrhage and the Schmidt Scoring system was used to determine the degree of severity of pancreatitis. In conclusion, there was a marked difference between the two groups in favour of the omental flap as regards levels of LDH and serum amylase. also pathological examination was in favour of the group with the omental flap.